How are you guys getting the game to use the new textures and whatnot you're making? Do they have to be repacked into the .LAB files somehow? Have you had any success editing a model and it displaying in the game? As for editing a model and displaying it in game, we can only do that through manually editing the numbers in a text .3do file, as we don't have a tool to convert .obj to text .3do yet. Fixing the texcoords for higher-res textures could easily be solved by doing the doubling during conversion with my tool, a one-line-change as always. Very neat. Manny the dog sniffs out a lead. 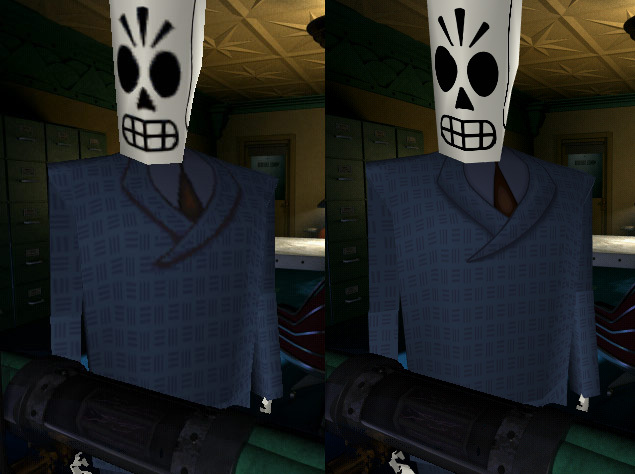 I see you have a Grim Fandango object viewer? Or at least there's a You Tube account with some interesting things in it. A year or two back I imported the text version of manny from the demo into Blender3d by hand because I didn't know any programming. It took 20-30 hours or something ridiculous. Then I managed to knock together a python program which would read the binary .3do files, and another one which would rebuild them inside Blender which is how I made the videos. This was a pretty slow process so after I took a class in OpenGL I wrote the model viewer. Wow, cool. It's interesting that your program only supports binary .3do and fails with text ones. I wonder if a version that supported text ones might be handy. Thinking outloud: I guess it might be handy to have a comprehensive list of the heirarchy of the .3do files... what .mats they use and which .cmp to match them with (although I suppose if 16-bit colour support is added, the .cmp files will be unnecessary?). provided the knowledge to read the .3do files from the game. Additionally http://jeffz.name/jkspecs_v04/ allowed .MAT and .CMP files to be read. There might eventually be 24-bit TGA-support for materials, as EMI uses that, I only hope GRIM doesnt need transparency, because the TGAs contain none of that. That should be OK, BMPs don't support transparency either. I recall a small number of the models have textures with transparency in them. I think they were mainly used for things like Hector's moustache and Eve's glasses. That being said I think they were only used to reduce the number of polygons on the models, so if we get the model editing working it wouldn't really be a problem. Oh I see... I guess it was a colour they picked that told the game to draw it as transparent? Yep, if the index into the palette is 0 then it is transparent. Keep in mind there's also a per-pixel z-buffer for occlusion of characters by objects in the environment. You can just quadruple that too when you render the backgrounds, but it'll probably lead to some fairly chunky silhouette edges when characters walk behind things. Yes, a higher resolution could be good, too. I don't know exactly how difficult that might be, though. Anti-aliasing adds a lot to the quality, too (making up for the lower resolution). Here's a comparison with Manny's latest texture (4x the size) with AA turned on. Are you planning to remaster every single texture from the game? And are you also planning to add higher detailed models which have more polygons? Ah yes, that's good to know. I'm not fully au fait with how the game's engine works, but I don't suppose those occlusion areas are stored as images that work as masks? That would obviously be very easy for me to then smooth the edges/plug the few gaps.